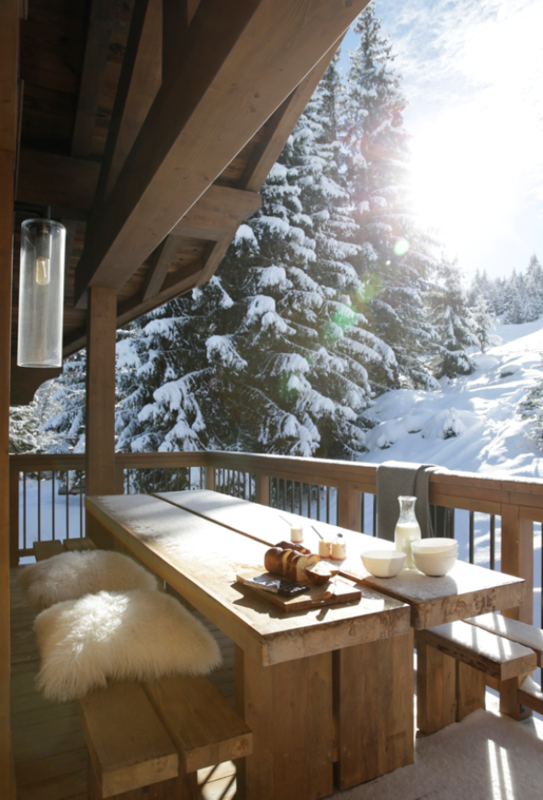 Winter in the mountains, to me, is all about the warm glow of a fire and the comfort provide by rustic materials, friends, spirits and a good view. It’s all about the view, a nice hike, and the deep quite of nature. With the majestic environment holding sway, ordinary materials used in extraordinary ways help to humanize the environment, providing beauty and interest within reach. 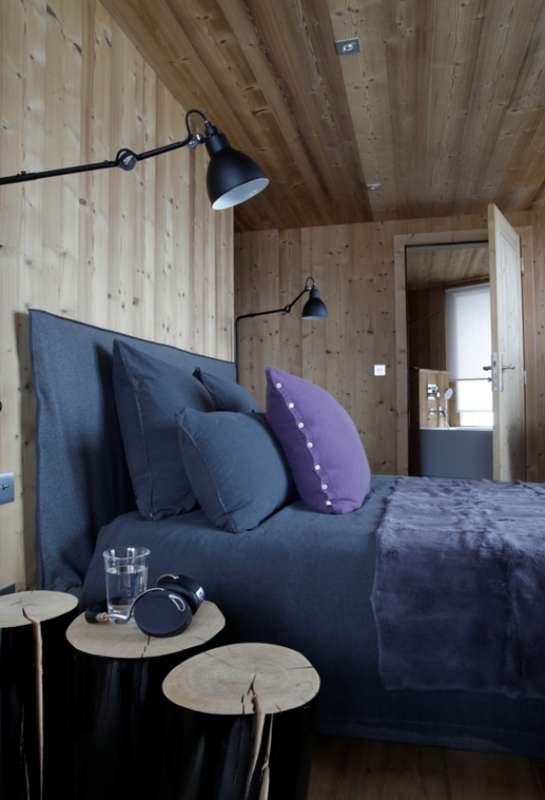 When designing a mountain ski retreat, I’d remove the fussiness and kitsch, provide straightforward, tactile furnishings and detailing, in order to create a contemporary and comfortable environment. 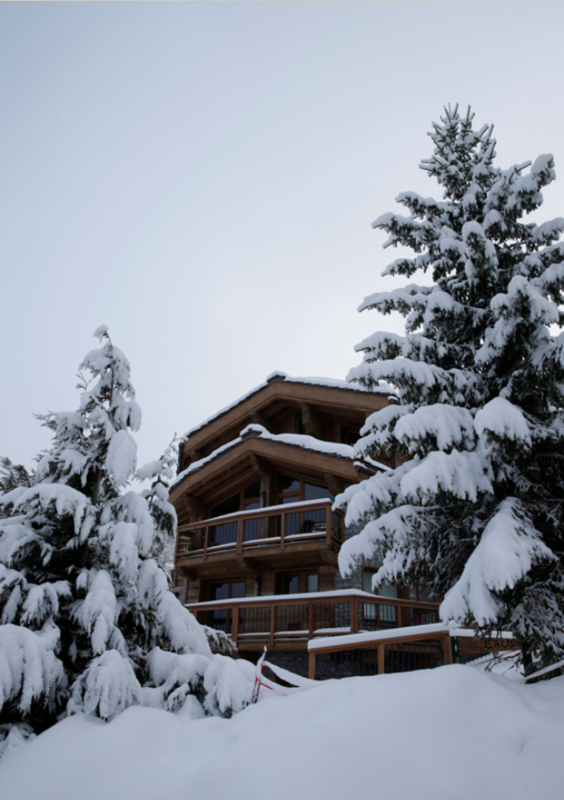 As a point of reference, the aesthetic of Angelique Buisson would look great in Tahoe and Mammoth. Here’s what we can take away from her work. Keep it practical. Use durable materials that handle the elements. Slate works great in bathrooms and mud rooms, and unfinished wood will keep looking better with age. 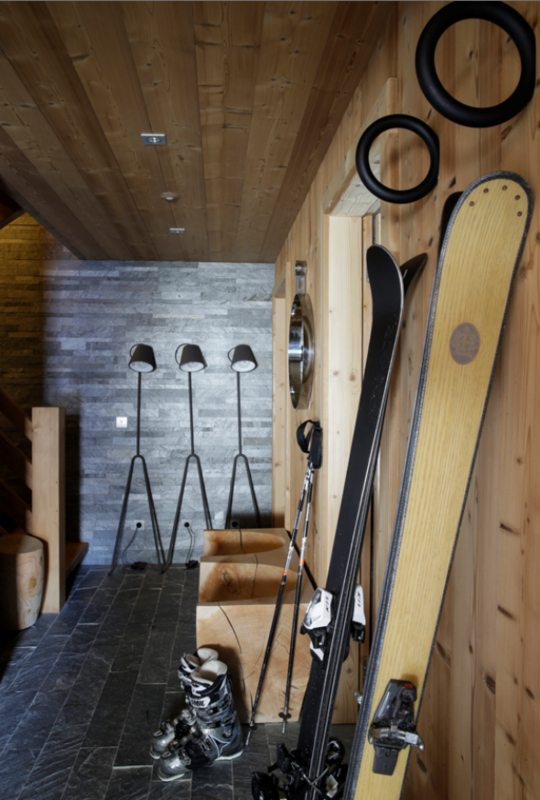 This mud room uses slate, installed in a modern-looking, long board format which echoes the wood planks. Have fun. Animate a space with artful use of materials. Below are two examples, one using Bocci lighting, and one using inexpensive sconces found at the hardware store. Each is effective: one feels like blowing leaves in the wind, and the other creates a geometric pattern drawn by an intentional hand. 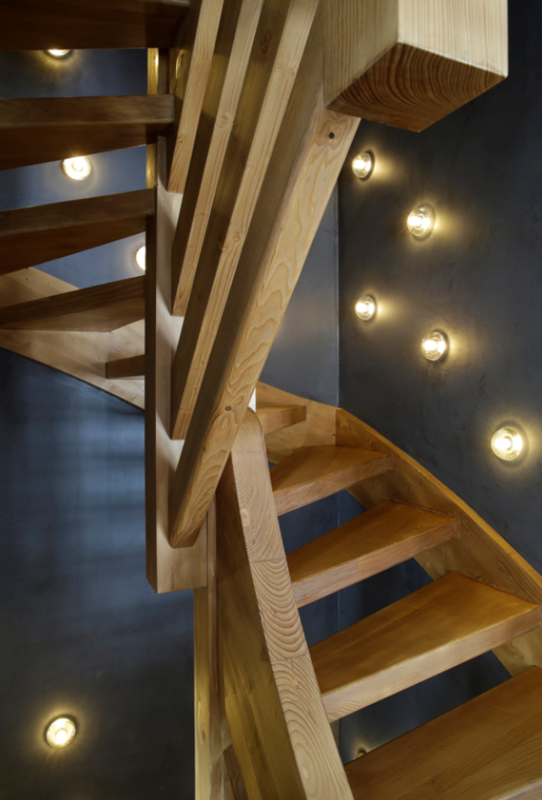 Bocci sconces animate this stairway. A light sculpture created with inexpensive sconces. 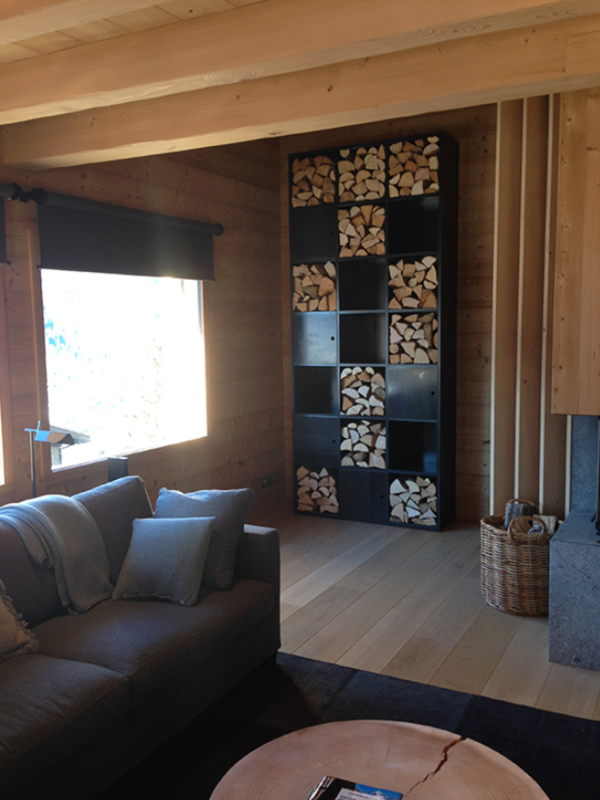 Storing wood takes on a geometric design. Clean it up. Remember you’re a modernist, so bring your aesthetic to the mountains. You don’t need to over decorate. Remove base boards, simplify door casing and window trim, and edit out fussy details. 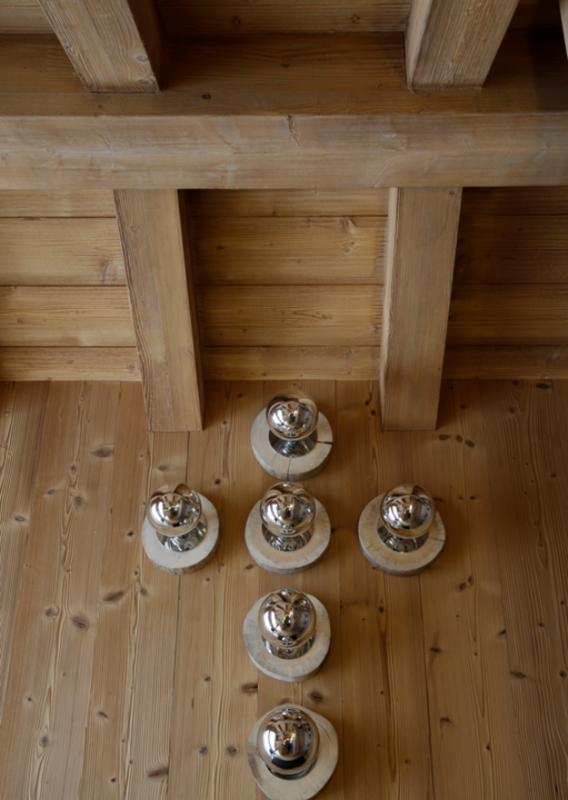 Even knotty-pine can get a contemporary feeling with thoughtful installation. 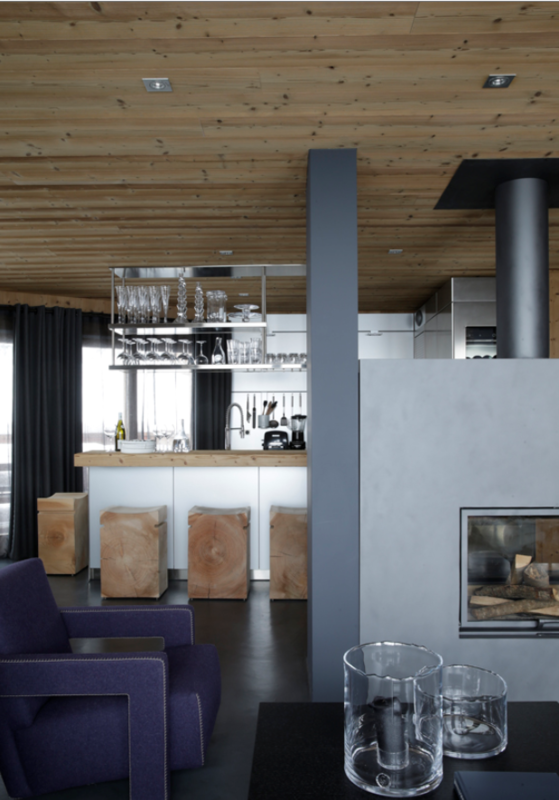 The simplicity of this living room is animated by the dark, moody floors with lots of grey contrasted with the warmth of the knotty wood walls and ceiling. I also love the aubergine Charlotte Perriand chair. Invest in design. A few carefully chosen pieces will elevate the design of a space. 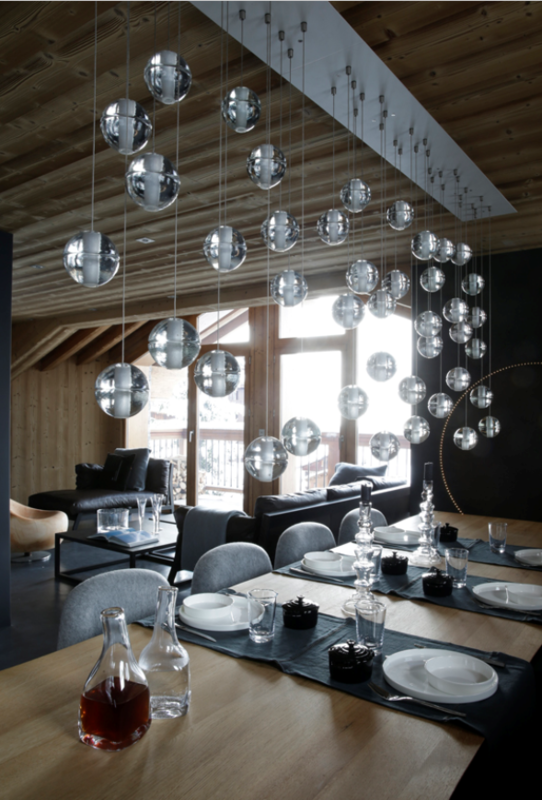 A Bocci fixture’s customized shape defines the dining area, and elevates the simple wood plank table. This looks like icicles hanging over an exterior table. The mix. In the end, it’s really about the mix. Unfinished wood and cashmere throws. Big blocks of wood and delicate china. 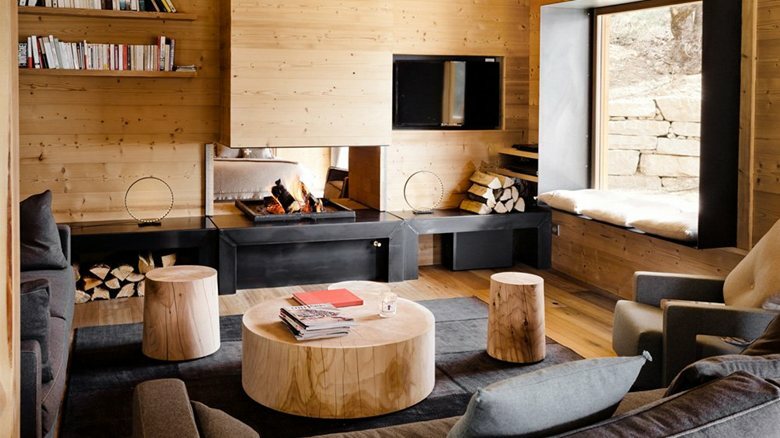 You want the space to feel rugged like the mountain but sophisticated like yourself. Veer too far in either direction and the space falls flat. 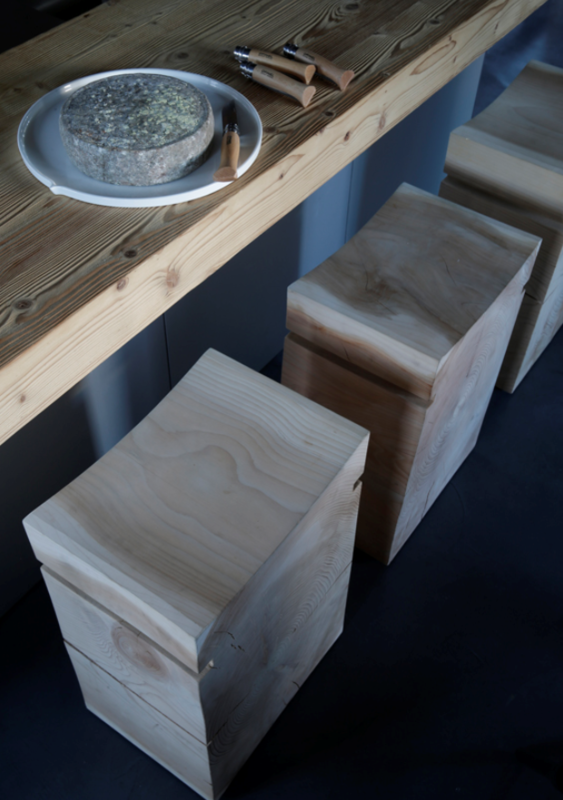 Rough countertop contrasts with the refined wood stool. Build window seats. What better place than with a view? And trust me, dogs and cats know this is the best spot to be. Make certain that you find a comfortable cushion and pillow. Then grab a book or an iPad, and enjoy the view. The most inviting area of this family room is the window seat. Make every space count. Use every square inch of your place, and make it usable throughout the year. Real estate is too valuable, and the view is sublime, so create inviting spaces throughout your building, including the exterior. Use throw pillows to make a morning snack more enjoyable. Cleanability. You don’t want to spend your time in the mountains worried about dirt. 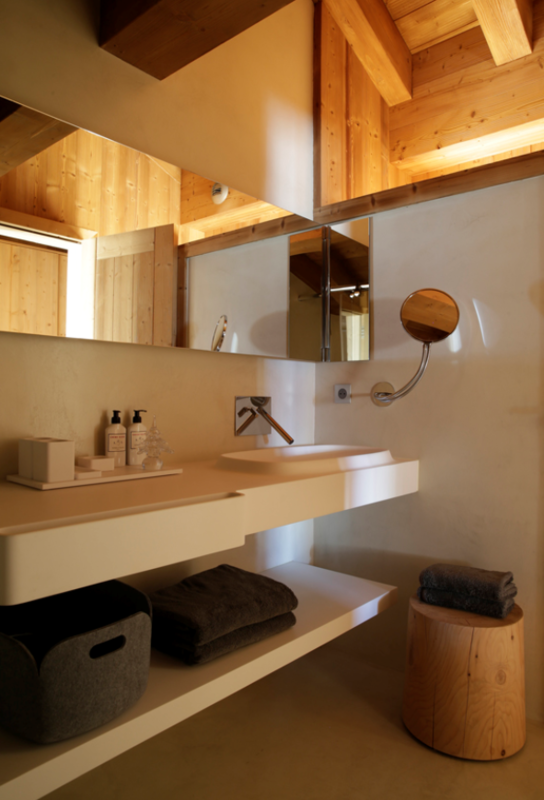 Simple, well design surfaces and materials will help keep your bathroom clean. 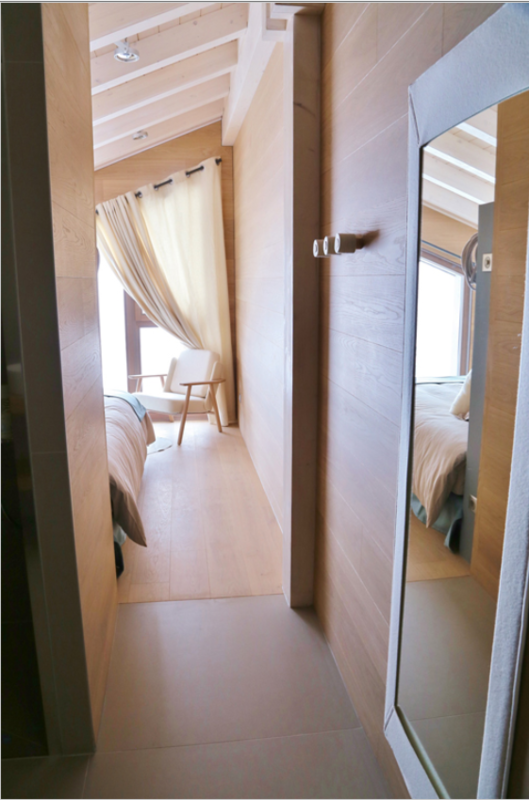 And by eliminating some of the details of your city home, you’ll create a more laid back environement…let’s call it refined camping. Exposed shelving keeps everything within view for easy access. A bonus is that you will be less likely to leave something behind. Create focal points. The eye leads you into a space, directing you in what to do. Come here, look at this, stay here for a while. 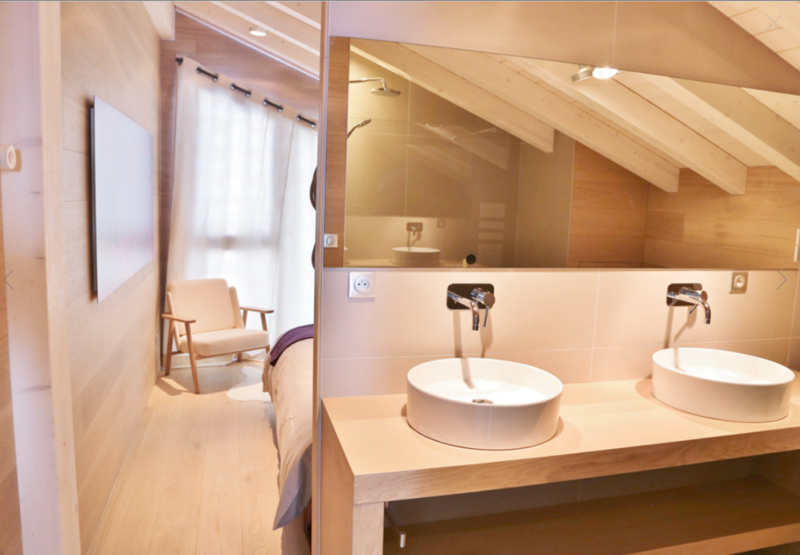 Your goal is to create a series of rooms that guides you and your guests. The result will be more inviting. A chair at the end of the hall invites you in to this bedroom, providing a place to linger. Add warmth. A cashmere blanket, sheep skins. A few pieces add a counter-point to the wood architecture of the space. 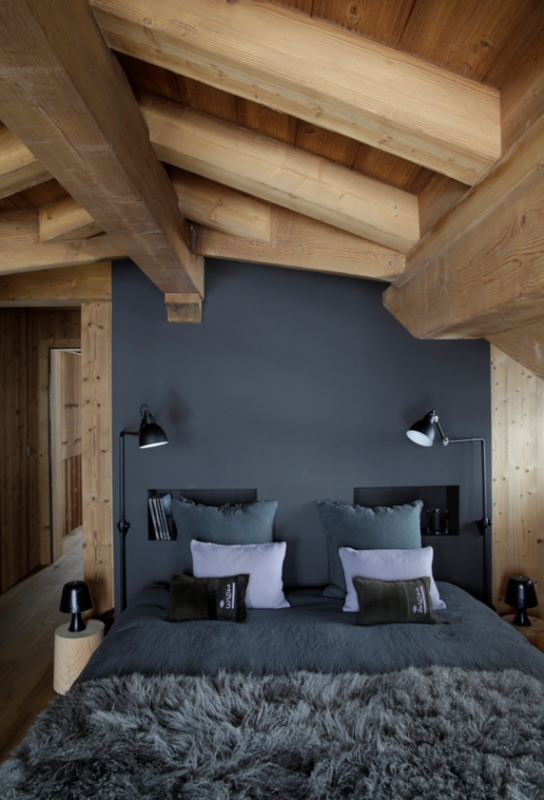 The result will be a home that feels welcoming after a day on the slope or out hiking the hills. 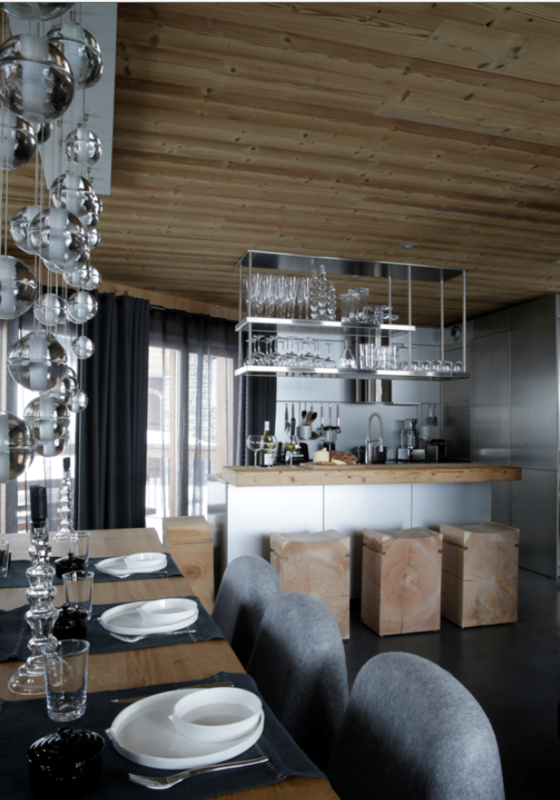 This is a chalet, not a fancy apartment in the city.